The longstanding and excellent Borromeo String Quartet returns to Vermont this weekend. And this time, the foursome will bring along a newer quartet: Gioviale, an award-winning student ensemble at the New England Conservatory in Boston, where Borromeo has been in residence since it formed 25 years ago. Called "4 x 4," the concert is part of the talented flutist Karen Kevra's chamber music series, Capital City Concerts in Montpelier. Instead of including a flute piece, as CCC concerts often do, the program features all strings. Gioviale will play Debussy's String Quartet in G-minor, followed by Borromeo performing Quartet No. 3 by Bartók, a composer whose early work found direct inspiration in Debussy. To finish, the quartets will join to play Mendelssohn's String Octet. The composer wrote his lively and complex Octet in E-flat major, op. 20 in 1825 at the astonishing age of 16 and revised it for publication seven years later, leaving behind two versions. Audiences who saw the Bill T. Jones/Arnie Zane Dance Company's performance at the Hopkins Center for the Arts last January heard Borromeo and Gioviale playing Mendelssohn's published version. Borromeo's first violinist, Nicholas Kitchen, says that's because the dance company choreographed its work around that version. At the concerts in Rutland and Montpelier, by contrast, audiences will hear the manuscript version. Kitchen notes "big changes" between versions, including 10 bars of music Mendelssohn simply cut. "There are some sections that really are a pity to have lost," says the violinist. Nevertheless, he adds, within the limited repertoire of string octets — perhaps 20 works, most dating from the second half of the 1800s — "it's very hard to beat the Mendelssohn. In both his versions, by the way." The original, still unpublished manuscript is held in the Library of Congress, Kitchen says, where he was able to access it digitally. The quartets will play the piece looking at the full handwritten score on their laptops while "turning pages" with foot pedals. Kitchen prefers this arrangement to the usual paper scores, which for space reasons display only each musician's part. Kitchen employs technology for more than just scores. In a bid to defy the evanescent nature of musical performance, he began recording Borromeo's every live performance in 2003. The group's Living Archive project makes each concert available on CD for purchase or, more recently, on YouTube for free. The project allows listeners to, say, compare two performances of the same work on successive nights. Kitchen assures that this weekend's concerts will be recorded, though he hasn't yet decided on a format for dissemination. 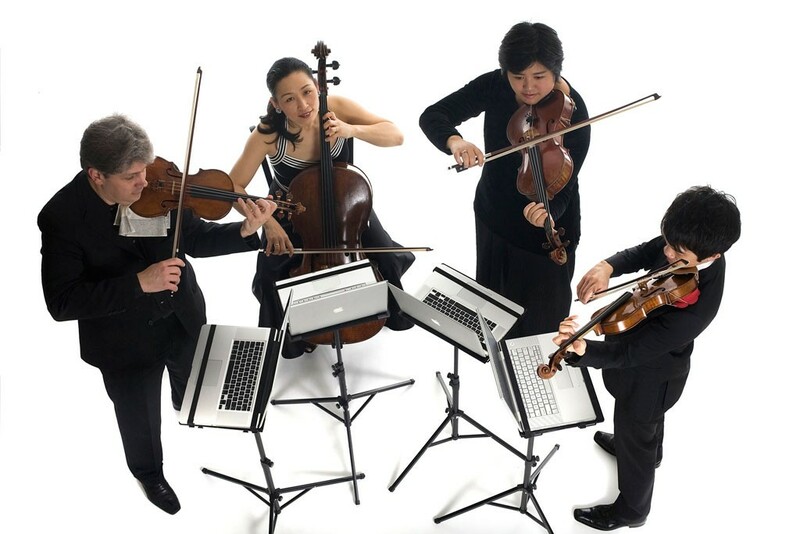 Gioviale String Quartet had to catch up on Borromeo's tech advances for the quartets' collaboration. That was not the only insight the young group gained from the established one. First violinist and NEC senior Jeremías Sergiani-Velázquez says the older group "pushes us to sound as good as we can." The Argentinian forms Gioviale with violinist Li-Mei Liang, violist Ting-Ru Lai and cellist Kenny Lee. Borromeo's long history of playing together, Sergiani-Velázquez notes, "gives them a certain identity and personality." (Borromeo cofounders Kitchen and Yeesun Kim, on cello, were more recently joined by violinist Kristopher Tong and violist Mai Motobuchi.) Meanwhile, Gioviale's members, two of whom are graduate students, have been together for less than two years. The group was chosen as one of five classical honors quartets at the NEC, both this year and last. When Gioviale formed, says Kitchen, he noticed "they had a really special commitment to what they were doing." Gioviale already plays on a professional level, he adds, so "there's an awfully rich exchange that happens" in playing together. Sergiani-Velázquez agrees. "It's a lot of fun to play with them," he says.